Place hamburger in casserole dish (raw). Sprinkle chopped onion over hamburger. Pour celery soup over this. Sprinkle with Cheddar cheese. 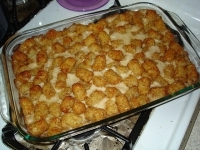 Place Tater Tots on top. Bake at 350° for 1 hour and 15 minutes.